How a dad can be a hero in his wife’s eyes by choosing the right group 2-3 car seat. Viaggio 2-3 Flex car seat is is ideal for babies from 3 to 12 years of age (15 – 36 kg). On becoming a parent, the choice of car seat is the first decision that really involves the father. After the indispensable modular system, or ‘trio’, the time has finally come for the men to have their say. Because, let’s face it, in their first few years of life, children are almost exclusively the mother’s concern. The father usually plays the role of a forgetful, clumsy and often unreliable partner. Or at least, that’s how mothers see them at first. How a dad should choose a group 2-3 car seat. aesthetic factors, without thinking about safety, convenience and comfort. Any one of these false steps – the last one in particular – would cost the unfortunate dad dearly! 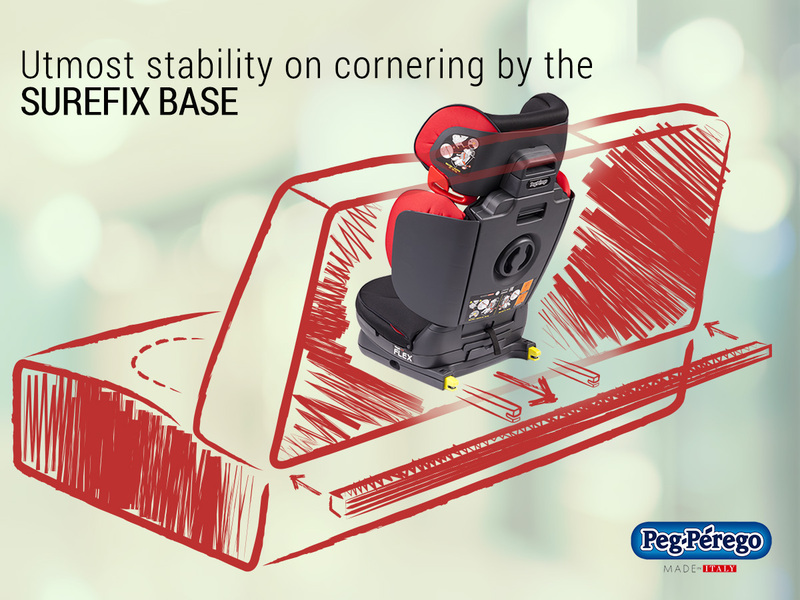 To their rescue, here comes the latest Peg Perego car seat, Viaggio 2-3 Flex. This comprehensive solution keeps children safe when traveling by car, and keeps dads safe against anxious mother hens. Surefix Base: maximum safety, even with a…shall we say… sporty driving style. While seated in a Viaggio 2-3 Flex car seat, your child can count on the best possible protection. This is because Peg Perego safeguards all the most sensitive parts of the body, such as the head, back, neck and chest. This new seat protects your little ones against side and rear impacts and against whiplash by means of an aluminum-reinforced backrest. Moreover, the built-in Surefix Base ensures maximum stability when cornering or indulging in a spot of sporty driving (when the wife’s at home, of course). One seat for every need. Your friends’ garages have become a deposit of childhood items: high chairs, changing tables, toys … and a variety of car seats for different ages. The flexibility of Viaggio 2-3 Flex makes its the best choice, also from this point of view. 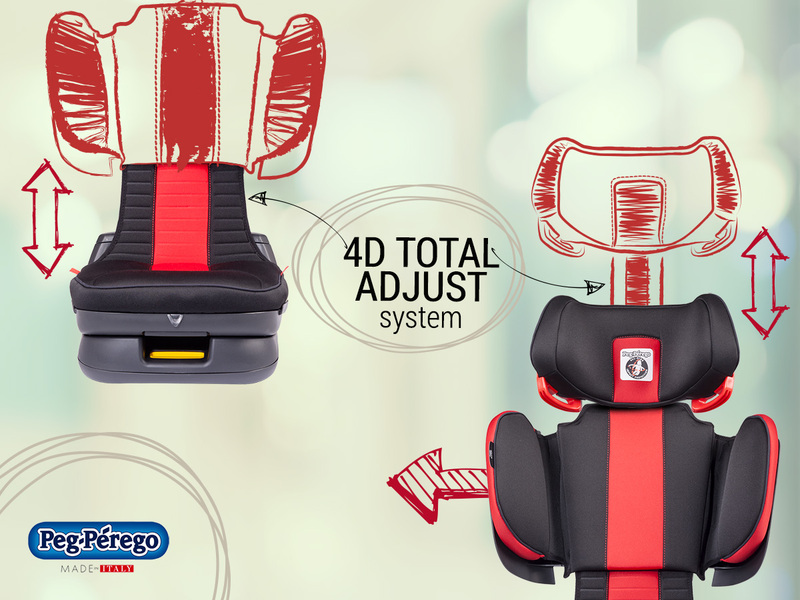 Its 4D Total Adjust feature means that it can be adjusted in 4 different ways: headrest (5 positions relative to the backrest), upper part of the backrest (3 heights), side protections (the width increases by up to 10 cm) and anatomic seat (5 positions, adjustable with one hand). In addition, the new Blind Lock coupling system prevents the child seat from being inadvertently released by anyone sitting next to the child. Viaggio 2-3 Flex, therefore, offers an extremely high level of comfort, as it can be widened and heightened, following your child’s growth from 3 to 12 years of age (15 – 36 kg). This is a very important practical aspect, and one that will undoubtedly appeal to your wife for its far-sightedness. Fold it and take it with you, just like a gym bag. 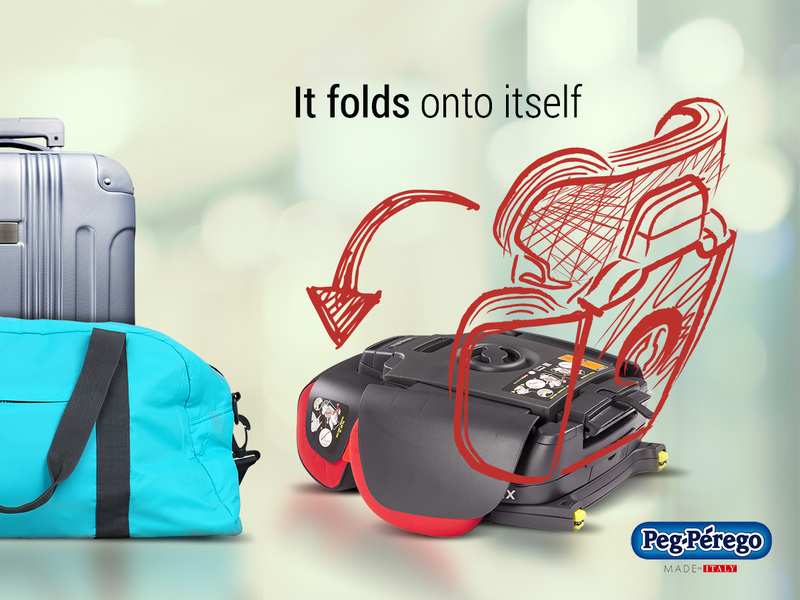 Here at last is a car seat that folds and is as easy to carry as your gym bag. Viaggio 2-3 Flex folds in on itself, making it handy to carry. Moreover, if you need to leave it folded away in the car, it is less subject to the wear and tear caused by heat as the inside is protected from direct sunlight. Finally, when your child is not with you and you have passengers in the car, you can easily fold your Viaggio 2-3 Flex and store it in the trunk. Fantastic, right?! Handling strollers, infant carriers, bassinets and car seats is usually dad’s task, but with the highly versatile Viaggio 2-3 Flex, mom will have no trouble stepping in. Safe, flexible, practical, and attractive to boot! Viaggio 2-3 Flex is a car seat that will make you feel a great family man, caring and attentive to the safety of your child. You have made the right choice, as it is almost impossible to find another car seat that can claim to have all these qualities together in one product. You’ve become a hero in your wife’s eyes, because you have thought of both the safety and comfort of your child. From now on, your little tot will be able to enjoy the comfort of a veritable little armchair, which can even be reclined with one hand! On top of everyone’s satisfaction, you can reap the benefits of your own personal gratification: among all the car seats available, you have made the best possible choice, also in terms of aesthetics! With its sporty design, high quality finish and fabric-leather mix, your only regret will be that you were unable to go for a spin in it yourself when you were small, as at that time these latest generation products did not exist. Because Viaggio 2-3 Flex is just like one of those armchairs from which pilots would control their super robots in the Japanese cartoons you used to always watch in the ’80s. So Dads, rest assured that you have made an excellent choice and ensured your children’s safety at best. Now, all that’s left is to take your family for a spin with Viaggio 2-3 Flex!